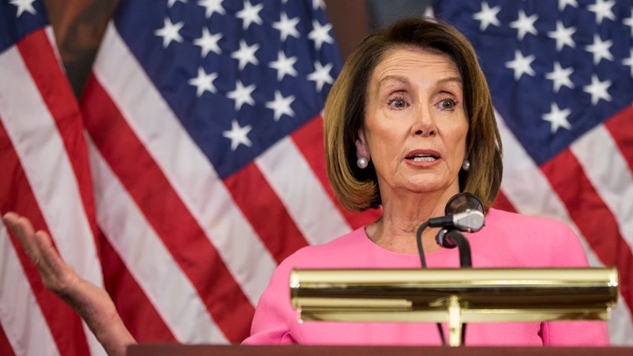 Nancy Pelosi has staked out two contradictory positions in the wake of the 2018 midterms. First, she said that she wants to compromise with Republicans, who spend every single election cycle denigrating her nonstop. House Democratic Leader Nancy Pelosi is poised to work with House Democrats to set up a special committee focused on climate change in the new Democratic-led Congress, a panel that would allow the party's members on Capitol Hill to draw attention to the threat posed by of global warming. Before I get into this critique of Pelosi, I need to point out that it's completely absurd that Chuck Schumer's leadership has not been called into question. The fact that Pelosi may not be Speaker of the House next year, but that Chuck Schumer's Senate “leadership” is beyond question is really all you need to know about how sexism still plays a massive role in politics—even on the left. Pelosi is at least useful when it comes to fundraising, and she has demonstrated a center-left streak over the years. Schumer's testicles are kept in a jar on Wall Street, and his biggest accomplishment as a Senator is confirming a litany of unqualified conservative judges to lifetime appointments. Schumer is a de facto Trump supporter, and any sane liberal party would purge him from their ranks—let alone leadership—immediately. But this is a piece about Pelosi, not Schumer, so back to the topic at hand: what the hell is going on? One cannot engage in a “bipartisan marketplace of ideas” and aggressively pursue legislation to combat climate change. That's like saying you want to have kids and then getting a vasectomy. The Republicans do not believe that climate change exists, which means that (at least) one of these statements is complete and utter BS. If I were a betting man (and I am), I would bet on the climate change caucus being the thinly-veiled nonsense from Pelosi. The “bipartisan marketplace of ideas” is straight out of a Democratic consultant's playbook, as they benefit from convincing Democrats that Lucy won't pull the football away this time. Every time Democrats lose, these braindead D.C. lanyards convince Democrats that the problem is that they're not Republicans. Even when they win, that seems to be the standard line coming from the consultant class, and that's because any party which is allied to capital inherently opposes liberalism, because liberalism aims to reduce capital's power. Climate change is the most obvious evidence of this dynamic, as just 100 businesses are literally destroying the planet for profit. If we cared more about the future of mankind than we do profit, we would have done something about these planet poisoners a long time ago. But we don't, thanks to the last generation of failed liberal politicians like Pelosi and their “bipartisan marketplace of ideas” BS. There is no way that we can take the reforms necessary in the next ten years to avoid certain planetary destruction in 20 years while adhering to the whims of the “free market.” We need a revolution that completely changes the energy source used by the planet, and fast. There is no in-between. So while a climate caucus in the House is an important step in the right direction, forgive my skepticism that a couple days after sticking her foot in her mouth, Pelosi announced that she backs a progressive initiative at the same time that she's fighting for her life as potential Speaker. Had she come out after the election and proposed this climate caucus instead of some meaningless “bipartisan” wordbarf, I would doubt her words far less, but this sure just looks like standard damage control in the wake of a progressive firestorm around her braindead “bipartisan” garbage. Our dedication to fighting climate change is our dedication to the future. Thanks @SenWhitehouse & all who are standing #Up4Climate tonight. On this #EarthDay, let us embrace our shared stewardship of this planet, preserve our environment, and avert the crisis of climate change. Last month, scientists issued a dire warning that we have roughly ten years to make unprecedented changes to our way of life, or else we would ensure that our planet would become hostile to humans in twenty years. Nancy Pelosi didn't even bring the study up, and the week that it dominated press coverage on the left, she made one allusion to climate change, but again framed it in a “bipartisan” sense. Pelosi’s own words demonstrate that historically, she cares far more about “bipartisanship” than climate change. I genuinely hope that her proposal to create a climate change caucus comes out of a sincere desire to reverse course and aggressively combat this threat to humanity, but if this is just a virtue signaling gambit to protect her Speakership, then she deserves the same fate as Chuck Schumer, and she should be remembered as the obstacle to climate progress that her “bipartisan” ideas have proven to be.